Queen Elizabeth was then on 27 February received in Adelaide by the Governor-General, Peter Hollingworth; the Australian viceroy, at the time, was in the midst of controversy involving allegations of child abuse cover-ups in the Anglican Church and demonstrators were present when the Queen and Prince Philip landed. The royal couple undertook a five-day tour through South Australia and Queensland, which also coincided with that year's Commonwealth Heads of Government Meeting in Coolum Beach. On the Queen's Birthday holiday for 2002, services of thanksgiving were held in churches and a bonfire was lit during a party at the Governor-General's residence in Canberra. Her Majesty The Queen of Canada has been unfalteringly by our side to celebrate our successes and to help us to grow together. Fifty years after her Accession to the Throne, Elizabeth II remains a symbol of continuity, stability and tradition in a world that is under a barrage of constant change. That is why Canadians are proud to celebrate the Golden Jubilee. Throughout the year, events were held across Canada to mark the jubilee, such as the Jubilee Levée held by Lieutenant Governor of Alberta Lois Hole, which was attended by more than 4,000 Albertans and at which Hole stated: "what we want to realize is how important the monarchy is to Canada and certainly to Alberta." For 12 days in October 2002, the Queen and the Duke of Edinburgh toured Canada, making stops in Victoria, Vancouver, Winnipeg, Toronto, Hamilton, Hull, Fredericton, Sussex, Moncton, and Ottawa. The trip was also unique in that it was the first royal visit to the new territory of Nunavut, where the royal couple made their first Canadian stop in Iqaluit. There, on 4 October, the Queen opened and addressed the new legislative assembly, stating in her speech: "I am proud to be the first member of the Canadian Royal Family to be greeted in Canada's newest territory." After a walk-about through Iqaluit, the Queen unveiled one of the street signs on the town's main thoroughfare, which had been renamed in her honour. From Nunavut, the royal party flew to Victoria, where the Queen and Duke of Edinburgh were received by the province's lieutenant governor. Saturday was spent at a private retreat and, on the Sunday, the Queen attended religious services at Christ Church Cathedral, performed an unscheduled walk-about after the sermon, and travelled to the provincial parliament building to unveil a stained glass window commemorating the Golden Jubilee. Once Her Majesty was outside of the legislature, the Snowbirds performed an acrobatic fly-by for the sovereign and a gathered audience of some 16,000. In Vancouver, on 6 October, the Queen, accompanied by Wayne Gretzky, and in front of a crowd of 18,000 at General Motors Place, dropped the ceremonial first puck for the National Hockey League exhibition game between the Vancouver Canucks and San Jose Sharks; this was the first time any reigning monarch, Canadian or otherwise, had performed the task. The Queen and the Duke then watched the first period of the game from the royal box—the first time they had done so since their first hockey game at Maple Leaf Gardens in 1951. Premier Gordon Campbell said during the visit: "Your Majesty, much as the world has changed in the last 50 years, one thing has always remained constant—the sincere affection between the people of British Columbia and their Queen." The couple was next in Saskatchewan, unveiling on the grounds of the provincial parliament the product of the Golden Jubilee Statue Project: a bronze equestrian statue of the Queen riding Burmese, a horse gifted in 1969 to the Queen by the RCMP. In Winnipeg, Manitoba, the Queen performed a walk-about at The Forks, re-dedicated the newly restored Golden Boy statue atop the Manitoba Legislative Building, and attended an evening performance of the Royal Winnipeg Ballet, accompanied by the Winnipeg Symphony Orchestra and Loreena McKennitt. Her Majesty and His Royal Highness were on 9 October welcomed to Ontario by the lieutenant governor and thousands onlookers in Toronto, and, that evening, appeared at a festival, mounted at Exhibition Place, highlighting the advance of the province over the previous five decades. After a day of relaxation, the Queen then ventured to Sheridan College, to view students learning computer animation, and Hamilton, where at Copps Coliseum she, as their colonel-in-chief, presented the Argyll and Sutherland Highlanders of Canada with their new Colours. Rejoined by her husband, Elizabeth attended at the Canadian Broadcasting Corporation's Toronto headquarters an event marking the organisation's 50th anniversary; there, she viewed exhibits and was amused by a video display showing her earlier tours of Canada in the 1950s. Finally, the royal couple were in the audience at Roy Thomson Hall for a gala concert of Canadian talent, including Oscar Peterson, Evelyn Hart, Rex Harrington, Cirque du Soleil, The Tragically Hip, and others. At the same time, the Lieutenant-Governor-in-Council named a park near Gravenhurst as the Queen Elizabeth II Wildlands Provincial Park and created the Ontario Golden Jubilee Award for Civilian Bravery. As the tour continued on to the maritime provinces, the royal party arrived at Government House in Fredericton, New Brunswick, where they were welcomed by thousands. The stop in this province was brief, however—only 25 hours in total—with the Queen and Duke of Edinburgh flying by helicopter the following morning from Fredericton to Sussex and then on to Moncton, where they attended a luncheon in Dieppe to celebrate the town's 50th anniversary and officially opened a new terminal at Greater Moncton International Airport. From the east coast the royal couple flew westwards again to the national capital, Ottawa, to be greeted there by Deputy Prime Minister John Manley, who had earlier, on the day of the Queen's arrival in Canada, caused controversy by stating Canada should become a republic. The day following, 13 October, a multi-faith Thanksgiving celebration was held on Parliament Hill for about 3,500 people, and the Queen laid a wreath at the Tomb of the Unknown Soldier. A state dinner was held that evening at the Canadian Museum of Civilization in Gatineau, Quebec, at which Her Majesty said: "[I wish] to express my profound gratitude to all Canadians... for the loyalty, encouragement and support you have given to me over these past 50 years." As her motorcade passed across the Ottawa River into Quebec, about 100 protesters yelled obscenities at the Queen in French, waving Quebec flags and chanting "We want a country, not a monarchy"; it was the only protest during the jubilee tour of Canada. On the last full day of the tour, the Queen, as Honorary Commissioner, watched a performance of the Royal Canadian Mounted Police's Musical Ride before moving to her final major event in Canada: a lunch at Rideau Hall for fifty distinguished Canadians—one from each year of Elizabeth's reign. The Queen also planted another tree on the grounds of her Canadian residence, and met with members of the Royal Commonwealth Society. The Queen and the Duke of Edinburgh then departed Canada on 15 October. Elizabeth's first official engagements related to the Golden Jubilee took place in Jamaica; for the country, the Queen had acceded in 1952 as monarch of the United Kingdom and became distinctly Queen of Jamaica 10 years later; her tour of the island therefore coincided with the country's 40th anniversary of independence. She arrived for the celebrations on 18 February 2002, nine days following the death of her sister, Princess Margaret, Countess of Snowdon; the Queen established a short period of private, though not state, mourning. Elizabeth was first welcomed in Montego Bay, after which she travelled to Kingston and stayed at her Jamaican Prime Minister's residence, Jamaica House. Despite some anti-monarchical sentiment in the country at the time, the Queen and Duke of Edinburgh were "enthusiastically welcomed" by Jamaicans; 57% of those polled said the visit was important to the country and large crowds turned out to see Elizabeth, though there were small protests by Rastafarians seeking reparations for slavery and their repatriation to Africa. The Queen received an official welcome at King's House, the Governor-General's residence, met with Jamaican veterans of the First World War, addressed her Jamaican parliament, and visited an underprivileged area of Kingston, known as Trenchtown, viewing urban poverty projects while there. The tour ended on a unique note when, at the final banquet in Jamaica, a power outage plunged King's House into darkness during the meal; Elizabeth described the event as "memorable". Following her tour of Jamaica, the Queen next toured New Zealand, making stops in Auckland, Taupo, Christchurch, and Wellington. She and the Duke of Edinburgh arrived in the country on 22 February, just after Prime Minister Helen Clark said in a speech that she felt it "inevitable that New Zealand will become a republic." The royal couple were greeted by the Governor-General and other officials when they disembarked from the Royal Flight; Clark was absent, as she was at a meeting of centre-left leaders in Stockholm, Sweden. A low turn out was reported to see the Queen when she arrived at the airport, while an estimated 4,000 people came to view the Queen in Auckland. Celebrations for Elizabeth II's Golden Jubilee took place throughout the United Kingdom between May and July 2002. In the lead-up to those festive weeks, the British media—The Guardian, in particular—predicted that the jubilee would be a failure, arguing that Britain was no longer interested in the monarchy; a pervading sense of apathy amongst the populace seemed to confirm this. However, the predictions were proven wrong, especially during the official jubilee weekend, when people numbering in the hundreds of thousands turned out to participate in the fêtes. These festivities culminated in the 4 June event on The Mall in London, when over one million attended the parade and flypast. The Daily Mail stated in its editorial: "How the sour anti-Royalists in The Guardian newspaper and elsewhere have been confounded. They were convinced that the occasion would be a flop, that the House of Windsor was no longer capable of inspiring the loyalties it once did and that anyway the concept of royalty was passe in cool Britannia." It was on 3 March that the Queen and the Duke of Edinburgh returned to London from Australia. Eight days later, on Commonwealth Day, the Commonwealth Secretariat unveiled at Buckingham Palace a portrait of Elizabeth, painted by Chinwe Chukwuogo-Roy that had been commissioned to mark the Queen's 50 years as Head of the Commonwealth; the work now hangs at Marlborough House, with a study kept as part of the Queen's collection at St James's Palace. At the end of the month, however, the Queen was dealt another blow when her mother died on 30 March; the Commonwealth realms observed a period of mourning, and on 9 April, the day of her funeral, more than one million people filled the area outside Westminster Abbey and along the 23-mile (37 km) route from central London to the Queen Mother's final resting place beside her husband and younger daughter in St George's Chapel at Windsor Castle. Plans for the Golden Jubilee in the United Kingdom went ahead as planned, and, after a dinner hosted by Tony Blair at 10 Downing Street for her and all her living former British Prime Ministers (Sir John Major, The Baroness Thatcher, Sir Edward Heath, and The Lord Callaghan of Cardiff), the Queen officially launched the celebrations in the UK with a speech to both houses of the British parliament at Westminster Hall on 30 April, marking the fifth time in five decades that Elizabeth II addressed her British parliament on her own account. The Queen spoke of 50 unforgettable years and the changes to British life and society in that time, and elaborated that the monarchy must change also; Elizabeth said she had "witnessed the transformation of the international landscape through which [the United Kingdom] must chart its course" and declared her "resolve to continue, with the support of [the Royal Family], to serve the people... to the best of [her] ability through the changing times ahead." For the Queen's goodwill visits, which commenced on 1 May, two to three days were spent in each corner of England; the Queen and the Duke first stopped in Cornwall, Devon, and Somerset before travelling to Tyne and Wear, then finally to Buckinghamshire and Berkshire. On 13 May, the couple were received in Northern Ireland, and visited such areas as County Fermanagh, Cookstown, and Omagh. Then, throughout much of mid-May, the royal couple were in London devoting much time to the promotion of the arts, attending the Chelsea Flower Show, dedicating the Queen's Gallery at Buckingham Palace, and attending a reception at the Royal Academy of Arts. The jubilee trips recommenced on 23 May with a six-day trip to Scotland; the royals first stopped in Glasgow, and then travelled on to Edinburgh, Dundee, Stornoway and Aberdeen, and, following the jubilee weekend in London, the Queen and Duke of Edinburgh on 7 June toured West Sussex, spent three days in Wales, touring Anglesey, Llanelli, and Cardiff. The next month, the royal couple made two-day trips to the West Midlands, Yorkshire (where the Queen visited the set of the soap opera Emmerdale), and the counties of Suffolk and Norfolk, as well as undertaking a three-day goodwill trip to Liverpool and Manchester, where the Queen opened the 2002 Commonwealth Games. The Queen closed out July by touring the East Midlands, and ended her domestic tour by visiting Lancashire. Amongst several other events independently organised to celebrate the Jubilee in June 2002 were the British Army's staging at Portsmouth of a special parade of 6,000 personnel from all three branches of the British Armed Forces, and the Queen's bodyguards mounted a conjoined parade, wherein 300 members of the Gentlemen at Arms, Yeoman of the Guard, and Yeoman Warders all marched together for the first time in the centuries since their respective foundations. Elizabeth also hosted a banquet for all of Europe's reigning kings and queens, one for all her incumbent Governors-General, and garden parties at both Buckingham Palace and Holyrood Palace for people born on Accession Day 1952. Around the country, street parties were organised, for which some 40,000 toolkits were distributed. The Golden Jubilee Weekend took place between 1 and 4 June 2002 in London, for which the Queen and Duke of Edinburgh left Scotland on 29 May to make final preparations. On the first evening, the Saturday, the Prom at the Palace took place in the gardens of Buckingham Palace and highlighted classical music; out of the two million who applied for tickets, 12,500 people were selected to attend, making the event the largest ever held on the royal property. The crowds were entertained by the BBC Symphony Orchestra and BBC Symphony Chorus, conducted by Sir Andrew Davis, and guest vocalists included Kiri Te Kanawa, Thomas Allen, Angela Gheorghiu, and Roberto Alagna. The following day, the Queen and her husband attended a church service at St. George's Chapel, Windsor Castle, while their family were present at thanksgiving services elsewhere in the United Kingdom; The Prince of Wales and his sons, Princes William and Harry, in Swansea; The Earl and Countess of Wessex in Salisbury; and The Princess Royal in Ayr. After time on 3 June touring Eton and Slough, Queen Elizabeth II and the Duke of Edinburgh returned to London and the former at 1:00 pm launched the nationwide BBC Music Live Festival, in which more than 200 towns and cities across the United Kingdom publicly played the Beatles song "All You Need Is Love". During the day, street parties were held around the country, and that evening, the Queen, the Duke, and other members of the immediate Royal Family, made themselves present at another concert on the grounds of Buckingham Palace; this fête, called Party at the Palace, showcased achievements in pop music over the previous 50 years, with headlining acts including Paul McCartney, Eric Clapton, Cliff Richard, and Tony Bennett. Queen guitarist Brian May commenced the event by playing his arrangement of "God Save the Queen" from the roof of the palace, and Paul McCartney concluded the night with such numbers as "While My Guitar Gently Weeps" and "Hey Jude", which were each performed before and after the Queen lit the National Beacon at the Victoria Memorial, the last in a string of 2,006 beacons to be lit in a chain throughout the world, echoing Queen Victoria's own Golden Jubilee in 1887. 12,000 guests were allowed into the concert, while an additional one million people thronged The Mall to watch and listen to the festivities on giant television screens and join in with the palace audience's singing from outside the gates of Buckingham Palace, and a further 200 million watched the televised event around the world. On 4 June, the entire royal family attended the National Service of Thanksgiving at St Paul's Cathedral, to which the Queen rode in the Gold State Coach, followed by lunch at the Guildhall. There the Queen addressed the crowd and expressed pride at the Commonwealth's achievements, both during her reign as queen and throughout time; Elizabeth was quoted as saying: "Gratitude, respect and pride, these words sum up how I feel about the people of this country and the Commonwealth—and what this Golden Jubilee means to me." The jubilee procession then started along The Mall in the early afternoon; in addition to entertainers performing for the Queen, numerous floats were decorated to illustrate British life through the years of Elizabeth's reign and driven through The Mall. The parade concluded with 5,000 adults and children from the 54 member-states of the Commonwealth of Nations marching in their various national costumes before the Queen and presenting to her a "rainbow of wishes", consisting of handwritten notes from school children across the Commonwealth. In front of more than one million people, the Royal Family assembled on the balcony of the Centre Room of Buckingham Palace and watched a flypast consisting of every type of Royal Air Force aircraft in service (27 in all), Concorde, and the Red Arrows. There was only one publicly noted negative event in relation to the jubilee when approximately 40 activists, mostly drawn from the anarchist Movement Against the Monarchy, were arrested during a protest in the run-up to the Jubilee Weekend. In the Turks and Caicos Islands, a British Overseas Territory, for the first four days of June, celebrations took place throughout the Islands, presided over by Governor Mervyn Jones. The Public Relations Department of the Tourist Board for the Jubilee Committee produced the Jubilee Souvenir Brochure, with text and images covering historical Royal Visits provided by the National Museum; only 5,000 were produced, issue number 1 being given to Queen Elizabeth II herself. The museum also provided photographs for the production of three sets of stamps, and, for the Jubilee Weekend, prepared a temporary exhibition on royal visits, with other items from the past, such as the coronation medals issued in to some local residents in 1953. Other items produced to commemorate the Jubilee were a straw crown made on Middle Caicos by Loathie Harvey and Judy Geddis, two 20-crown coins, and a badge given to all school children as a memento of the historic occasion. The Golden Jubilee was also marked in New York City, where the pinnacle of the Empire State Building was lit in royal purple and gold. The city's mayor, Michael Bloomberg, and officials at the British consulate said the tribute was a sign of thanks both to the Queen for having had the American national anthem played at Buckingham Palace during the Changing of the Guard on 13 September 2001 and to the British people for their support afterwards. It had been more than 10 years since the Empire State Building gave such an honour to an individual not from the United States; the most recent instance was when Nelson Mandela visited New York after his release from prison in 1990. Before, during, and after the jubilee year, souvenirs were created, monuments unveiled, and public works named in commemoration of the royal event. In Australia, Australia Post released a special stamp combining old and new images of Queen Elizabeth II, along with a booklet outlining the Queen's reign. In Canada, the Governor-in-Council earmarked $CAD 250,000 as a donation in the Queen's name to the Dominion Institute's Memory Project, aimed at educating Canadian youth on the experiences and contributions of the country's veterans from the First World War through to modern peacekeeping missions. The provinces also marked the milestone; the Ontario Governor-in-Council, on the advice of his premier, approved the renaming of Dalton Digby Wildlands Provincial Park as the Queen Elizabeth II Wildlands Provincial Park and, in Saskatchewan, an equestrian statue of Queen Elizabeth II was commissioned and erected alongside the Queen Elizabeth II Gardens on the grounds of the Legislative Building. 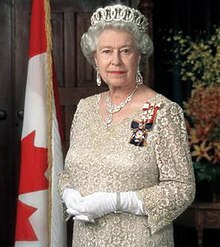 In Alberta, the Queen Elizabeth II Golden Jubilee Recognition Act established the Queen's Golden Jubilee Citizenship Medal, the Queen's Golden Jubilee Scholarship for the Visual and Performing Arts, and the Premier's Citizenship Award in Recognition of the Queen's Golden Jubilee. A special £5 coin was released in the United Kingdom to celebrate the event, and the annual Queen's Golden Jubilee Award for volunteer service groups was founded in 2002, while private enterprises produced various ornaments and trinkets as memorabilia of the jubilee; manufacturers such as Spode created various forms of commemorative china and crystalware. At Windsor Castle, the Jubilee Gardens were opened, the first new public area to be created since 1820, and a 167 feet (51-metre) inverted roller coaster, Jubilee Odyssey, was constructed at the Fantasy Island theme park in Lincolnshire. It was argued in retrospective analysis that the jubilee had been of benefit both to nationalism and the monarchy; the Daily Mail stated: "Below and in front of her an event as magical and magnificent as the Golden Jubilee itself was unfurling before her captivated eyes—Britain was rediscovering the land of hope and glory," and The Globe and Mail said: "When she daintily bent over to drop a puck at an NHL game... she achieved perhaps the most brilliant melding of symbolism in Canadian history... The Jumbotron in Vancouver's GM Place said it all, flashing the Queen's golden EIIR cypher on the giant screen atop the beer advertisement: 'I am Canadian'. The crowd went hysterical." ^ a b c d e f g h i The Royal Household. "Her Majesty The Queen > Jubilees and other milestones > Golden Jubilee > 50 facts about The Queen's Golden Jubilee". Queen's Printer. Retrieved 25 November 2009. ^ Blair, Tony (23 November 2000). "House of Commons Debate". In House of Commons Library; Pond, Chris. Golden Jubilee 2002 (PDF). Westminster: Queen's Printer (published 13 January 2003). p. 5. SN/PC/1435. Archived from the original (PDF) on 5 June 2011. Retrieved 25 November 2009. ^ Barkham, Patrick (28 February 2002). "Queen triumphs through scandal and dust". The Guardian. Retrieved 1 December 2009. ^ a b House of Commons Library; Pond, Chris (13 January 2003). "Golden Jubilee 2002" (PDF). Westminster: Queen's Printer: 7. SN/PC/1435. Archived from the original (PDF) on 5 June 2011. Retrieved 25 November 2009. ^ Barkham, Patrick (31 May 2002). "Australians shun jubilee celebrations". The Guardian. Retrieved 1 December 2009. ^ Department of Canadian Heritage. "Monarchy > The Canadian Monarchy > 2005 Royal Visit > The Queen and Canada > 53 Years of Growing Together". Queen's Printer for Canada. Retrieved 24 May 2007. ^ Hoople, Chelsea (2002). "Alberta honours its citizens in the name of the Queen". Canadian Monarchist News. Toronto: Monarchist League of Canada. Autumn 2002. Archived from the original on 8 July 2009. Retrieved 27 June 2009. ^ Kay, Christine; Kearsey, Tara (7 October 2002). "Royals start tour in Iqaluit". Northern News. Archived from the original on 3 June 2013. Retrieved 28 November 2009. ^ "Queen visits GM Place to drop ceremonial puck". Spirit of Vancouver. Vancouver Board of Trade. 7 October 2002. Archived from the original on 22 November 2005. Retrieved 28 November 2009. ^ "Queen to drop puck at Vancouver hockey game". CTV. 15 September 2002. Archived from the original on 22 January 2005. Retrieved 28 November 2009. ^ "Queen greeted by thousands of admirers in Winnipeg". CBC. 8 October 2002. Retrieved 9 May 2007. ^ "Queen helps CBC TV mark 50th anniversary". CBC. 11 October 2002. Retrieved 9 May 2007. ^ Ministry of Natural Resources (9 October 2002). "Queen Elizabeth II Woodlands Park". Queen's Printer for Ontario. Archived from the original on 23 March 2005. Retrieved 24 April 2007. ^ "Courage of the Queen". Canadian Royal Heritage Trust. Archived from the original on 9 September 2007. Retrieved 15 September 2007. ^ "Queen begins final leg of Jubilee tour". CBC. 13 October 2002. Retrieved 9 May 2007. ^ ""It means something to be a Canadian": Queen". CBC. 13 October 2002. Retrieved 9 May 2007. ^ "Queen dines with our best". CBC. 14 October 2002. Retrieved 9 May 2007. ^ a b c "Queen speaks to Jamaican Parliament". BBC. 19 February 2002. Retrieved 25 November 2009. ^ "Picture gallery: Queen in Jamaica". BBC. 19 February 2002. Retrieved 25 November 2009. ^ Brandreth, Gyles. Philip and Elizabeth: Portrait of a Marriage. London: Century. p. 31. ISBN 0-7126-6103-4. ^ Bates, Stephen (22 February 2002). "Republican pledge greets Queen". The Guardian. Retrieved 1 December 2009. ^ a b "Low turnout to welcome the Queen". TVNZ. 22 February 2002. Retrieved 22 August 2011. ^ "Helen Clark attends centre-left flock". TVNZ. 24 February 2002. Retrieved 22 August 2011. ^ "Royal tour draws to a close". TVNZ. 26 February 2002. Retrieved 22 August 2011. ^ Bates, Stephen (24 January 2002). "Palace plays down fears of jubilee flop". The Guardian. Retrieved 1 December 2009. ^ O'Farrell, John (2 February 2002). "God save the jubilee". The Guardian. Retrieved 1 December 2009. ^ "Press revels in jubilee spectacle". CNN. 5 June 2002. Retrieved 14 November 2007. ^ "Queen's Jubilee portrait unveiled". BBC. 12 March 2002. Retrieved 14 November 2007. ^ Wilkins, Verna (2002). Chinwe Roy. London: Random House. ISBN 1-870516-59-1. ^ Lock, Imogen (2003). Celebrate!. London: Sheeran Lock. ISBN 1-900123-90-8. ^ "Queues at Queen Mother vault". CNN. 10 April 2002. Retrieved 1 May 2009. ^ Katz, Laine (29 April 2002). "Former PMs gather for jubilee dinner". The Guardian. Retrieved 1 December 2009. 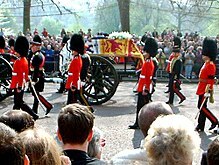 ^ Royal Household (4 June 2002). "Jubilee Journal". Royal Insight. London: Queen's Printer (June 2002). Archived from the original on 13 September 2005. Retrieved 16 September 2005. ^ "Jubilee protesters get damages". BBC. 4 February 2004. Retrieved 27 November 2009. ^ Sadler, Nigel. "Queen Elizabeth II Golden Jubilee Celebrations". Turks and Caicos National Museum. Archived from the original on 8 October 2007. Retrieved 4 November 2007. ^ a b Stanley, Jane (5 June 2002). "Empire State dons Jubilee colours". BBC. Retrieved 4 November 2007. ^ "The Government of Canada offers gift in honour of Her Majesty to commemorate 2005 Royal Visit" (Press release). Queen's Printer for Canada. 2005. Archived from the original on 1 September 2014. Retrieved 16 June 2005. ^ Ontario Parks (2006). Queen Elizabeth II Wildlands: Background Information (PDF). Toronto: Queen's Printer for Ontario. p. 1. ISBN 0-7794-9883-6. Archived from the original (PDF) on 4 July 2010. Retrieved 26 November 2009. ^ "Queen's Statue Maquettes Presented to Donors" (Press release). Queen's Printer for Saskatchewan. 4 February 2004. Archived from the original on 11 June 2011. Retrieved 29 November 2009. ^ Pandya, Nick (11 May 2002). "Celebrating the dawn of a golden age for royal memorabilia". The Guardian. Retrieved 1 December 2009. ^ Marshall, Doug (4 May 2002). "Riding the highs and lows". BBC. Retrieved 24 August 2010. ^ "Press revels in jubilee spectacle". CNN. 5 June 2002. Retrieved 13 January 2009. Wikimedia Commons has media related to Golden Jubilee of Elizabeth II.